Members of Living Green, flanked by LSRCA members. Over the past decade and half of volunteering and activism, I’ve learned that working to help our ecosystem and our fellow humans is often a thankless task. That’s why it’s especially rewarding when we actually receive recognition, as was the case earlier this month. Each year the Lake Simcoe Region Conservation Authority (LSRCA) salutes and celebrates the Lake's "Watershed Heroes" and this year, Living Green was honoured to receive the new Pioneering Green Community Award. We were recognized for our active involvement in planting trees through our newly-formed Urban Canopy Coalition. Over the past year the UCC has raised money to replace dead trees on public lands in Barrie, and partnered with the City and the LSRCA to plant over a thousand new trees including oak, maple, pine and tamarack at the Huronia Buffer site. To further prevent erosion and improve the environmental health of our green species, we have also begun to plant willows, shrubs, and trees on the river banks at Sunnidale Park. This coming year, with our partners, we plan at least two more tree plantings in the spring and fall, and will continue to interplant native pollinators in Queen’s Park along Toronto Street. Last year we were fortunate to receive a large donation from Barrie Chiropractic, and we are looking for new donations from businesses, large or small. Contact gwen@livinggreen.info if you would like to donate or volunteer with the tree planting. 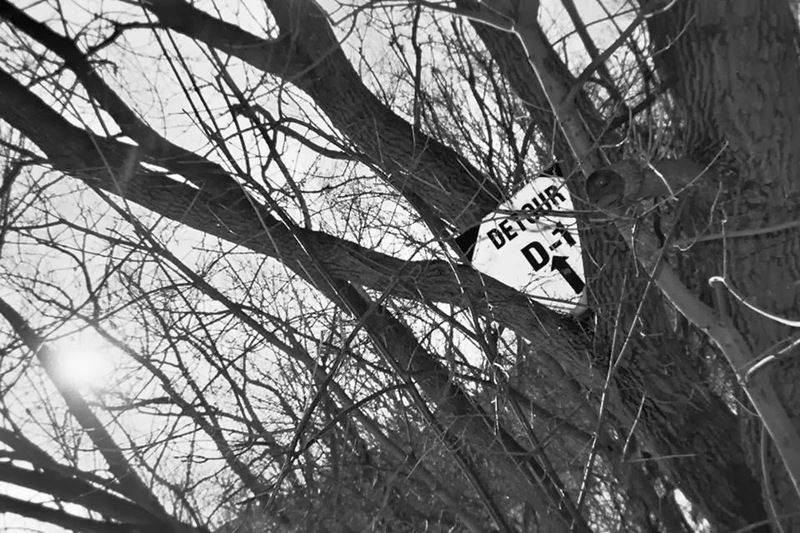 As UCC founder Gwen Petreman points out, we are still learning the many benefits of trees. Recently our knowledge of the importance of trees to the life of bees has expanded. Bees collect tree resin to make a material called “propolis” which they use to seal up the edges of their hive. But now we know it also has anti-bacterial and anti-microbial properties that protect the hive’s bees from many potential pests. Since bees pollinate about 1/3 of the food we eat, preserving trees means protecting bees which means feeding humans. We’re all connected! Living Green’s other initiatives include regular clean-ups of Queen's Park, maintaining the environmental focused website www.livinggreen.info operating Off the Rack thrift store with the Barrie Free Clothing Centre, hosting Green Screens and passing along traditional skills via the ReSkill Institute. Another LSRCA “Watershed Heroes” award went to the students of the Eco-Team at Newmarket’s Alexander Muir Public School in recognition of their successful ban of disposable water bottles and fundraising $2,500 for a filling station for reusable bottles at their school. I was thrilled to learn that this group of elementary students had succeeded in overcoming the powerful bottled-water lobby that so far has stymied many similar initiatives in our local municipality and school board, and gives me hope that future attempts here may yet succeed. It also gave us the idea of hosting our own Living Green awards ceremony to recognize the best Barrie-area school eco-clubs. I know there are some great initiatives going on at local schools, and I’m sure there must be some local businesses that would love to put their name on a trophy or an awards ceremony. If you or a business you know is interested in sponsoring that kind of event, we’d love to hear from you! Published as my Root Issues column in the Barrie (and Innisfil) Examiners as "Living Green's nod from conservation group means a great deal"
Are you ready for A Day in a Life? At the Food Not Bombs dinner last night the group’s founder and long-time organizer Keith McHenry spoke of the challenges sharing free food with the hungry. Powerful corporate interests don’t like to be shamed by juxtaposing their wealth with poverty next door; politicians must hide proof of their failed social and economic policies. So the cops are sent in to break it up, arrest volunteers, keep hungry people away from healthy food until it is trampled under-boot. The pretexts are lack of permits, unhealthy food, creating a disturbance, but the root issue is active denial that poverty is a real and growing problem despite decades of economic “growth”. Well-paid airheads of corporate-owned media opine that the poor aren’t really poor, because many of them own a refrigerator, microwave, TV or cell phone, miracle devices even a king could not obtain 150 years ago! Yet an old appliance won’t keep you fed or pay the rent, cover its own electric bill, treat a chronic illness. Too often the denial machine is successful, hiding how tough things really are for many in our own communities. Canada is lucky to not have as many examples of a violent government response to poverty, but I still encounter denial of the problems. Some assert that people are homeless by choice, or that most on welfare just don’t want to earn a living. If you nod your head at either of those ideas, you owe it to yourself to come down to Barrie’s City Hall Rotunda on Monday, November 18th for a reality check. From 11 AM to 6 PM, the Barrie Chapter of the Alliance to End Homelessness is hosting “A Day in a Life” to open your eyes, and heart. Interactive displays will be anchored by a full-scale mock-up of a ten-by-ten “furnished” room from a shelter or rooming house. Learn about links between poverty and poor health, struggles to afford a healthy diet, challenges of finding and maintaining decent housing. Obstacles are many. Physical or mental health problems or addictions can be a huge burden turning everyday situations into trials. 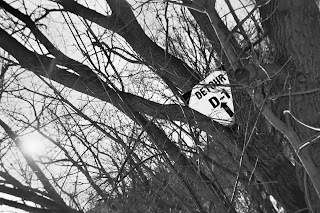 Unexpected events or “detours” can shake someone from a comfortable life into a downward spiral. A simple lack of income is stress enough to trigger a raft of difficult choices, few if any of them leading to a decent and secure lifestyle. This struggle exists right here in Barrie. If you think the solution is just to pull yourself up and make the best of it, then come to the display and show us how! At the income booth you’ll be issued the money someone on disability, welfare, or minimum wage receives, then make your way around the other stations to obtain food, transportation, clothing, health, and other basic needs and try to still have enough at the end to rent the 10x10 room. Job statistics in Barrie show improvement, but many are still a long way from economic security. There’s plenty of temporary work, but we don’t have temporary rents or temporary mortgages. Minimum wage doesn’t cover even a minimum healthy life; even less so on part-time hours, or if trying to support a family. Together we can build solutions, but first we must acknowledge and understand the problems. Are you brave enough to spend “A Day in a Life”? Published as my Root Issues column in the Barrie Examiner as "Job stats in Barrie look good, but we're a long way from economic security" or "Temporary work not enough"
Cooking with Keith and Food Not Bombs: a route to community or jail? In August I announced the resumption of Barrie’s monthly Food Not Bombs dinners, featuring community-prepared vegan meals offered free to all. My activities since then have kept me connected to local food security: helping at Rosie’s Thanksgiving dinner and providing the Barrie Food Bank over a ton of fresh fruit in FruitShare Barrie’s pilot season. Like all successful projects, these involve the efforts and donations of many community members, and luckily, these efforts seem to have the support of everyone who hears of them, or at least, nobody seems to speak against them. But I was surprised to learn, while researching Food Not Bombs, that this is not always the case elsewhere, that the simple act of feeding hungry people can lead to controversy, rejection, even arrest. A recent story caught my eye: an atheist club wanting to help the poor offered to volunteer at a church-run soup kitchen in South Carolina. They were rudely rejected, told they were in league with the devil! Luckily the group, Upstate Atheists, remains undaunted and has cooperated with other community groups, including religious ones, delivering help to those in need. It disgusts me that any faith organization would rather divide community than bring caring people together. But at least that was just a war of words. More concerning is people arrested and jailed for feeding the hungry on public property. That often happens to Keith McHenry, founder and organizer with Food Not Bombs for over 30 years. This author and artist has been arrested, jailed, beaten and tortured for his work promoting peace over militarism while addressing poverty, with Food Not Bombs targetted by authorities as a suspected terrorist group! In San Francisco, the charge was “making a political statement” by providing free food near the Golden Gate Bridge, something it’s hard to believe can be a crime in the “Land of the Free”. McHenry was also arrested in Orlando, Florida for similar activity. In that city, a group must have a permit to distribute food at a park, and can only do it twice per year, before moving to another park. Food Not Bombs counters that people need to eat every day, not just twice a year, and that some locations (including the picnic area they use at Lake Eola Park downtown) are a better fit for that community activity. 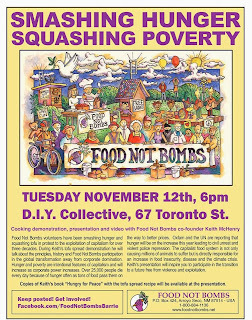 If you find this opposition as shocking as I do, come to the next Food Not Bombs dinner at 6 PM this Tuesday, November 12 at the D.I.Y. 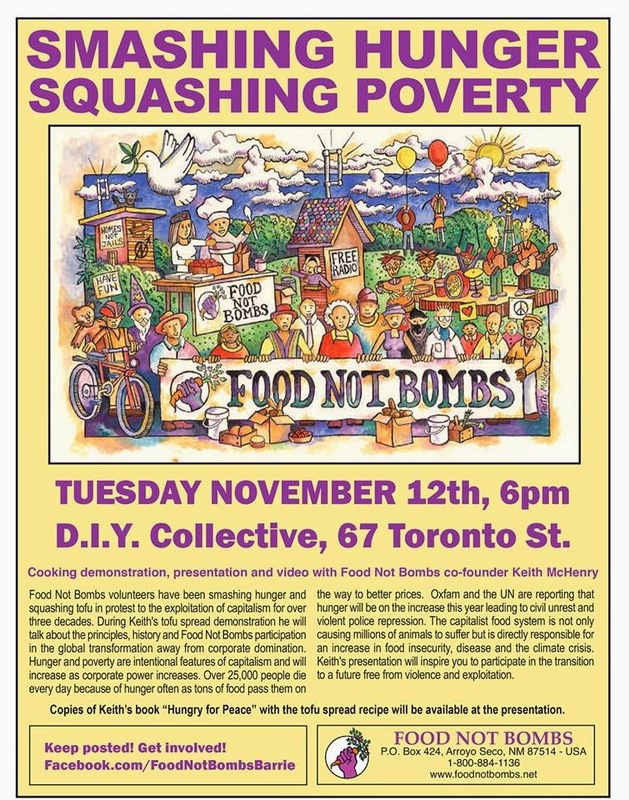 Arts Collective at 67 Toronto Street and meet McHenry himself, as he will be the keynote speaker of “Cooking with Keith”. As always, literature about various political and community causes will be present, but unlike some programs, you don’t have to take part in the service before you eat! Dinner comes first, followed by what promises to be a very interesting presentation and discussion. One of the principles of Food Not Bombs is to rescue discarded food that would otherwise be wasted, and redirect it to the hungry. An interesting documentary about food waste called “Dive!” will be featured at an upcoming Green Screen event hosted by Living Green. If you are interested in seeing this, sign up for newsletters at www.LivingGreen.info or www.TransitionBarrie.org and you’ll get an alert when the screening is scheduled. Published as my Root Issues column in the Barrie Examiner as "Food Not Bombs finding its way to Barrie"